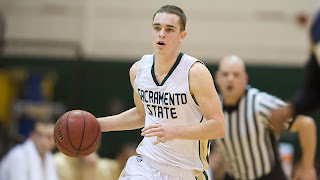 Big Sky Basketball: Same Old Sacramento State? Not too long ago, Sacramento State was 3-1 and leading McNeese State by 17 at the half, looking to make it 4-1. Since then, they have played five bad halves of basketball, looking every much the team that hasn't had a winning season in over 20 years. They had the second half collapse against McNeese State, got blown out by Cal Poly 77-51, and got pounded 82-53 by Oklahoma last night. Freshman PG Dylan Garrity, who has been so good for most of the season, struggled big-time against Oklahoma, with 4 assists against 7 turnovers. The Hornets turned it over 22 times, could not get consistency on offense, and could not stop the Sooners from scoring. With the loss, Sacramento State is down to 3-4 and have 4 non-conference games to go before the Big Sky schedule comes. They travel to Cal State Bakersfield, and then have 3 home games against Cal-Maritime, North Dakota, and SE Missouri. If they want to have a chance to finish at the .500 mark, they need to win at least 2, and probably 3 (or even better, all 4) of those games. Going 3-1 would put them at 6-5 headed into conference play (also with the Bracket Buster remaining). Given their less-than-steller conference record in past year's, this would at least give them a puncher's chance to win more than they lose. Sac State leaves me scratching my head. Here's a case where I definitely think it has to do with facilities. Get better facilties for basketball, and I think their forturnes turn for the better. Give them credit, Katz has done well to recruit some good players and it takes time to mesh. They are there, they are learning, they have done some nice things already this year. Season is still new! I think the facilities comment is worthwhile. Great facilities draw great athletes. I think Garrity is a amazing PG who Katz got lucky getting. If he added 15-20 pounds he would be unstoppable. I highly doubt he'll stick around the Big Sky though, he's good enough to move on.